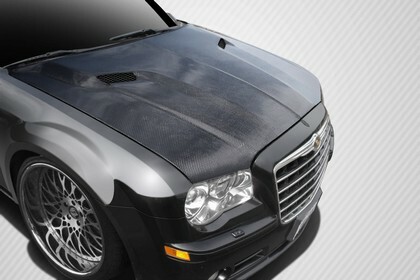 Carbon Fiber Challenger Style Hood 05-10 Chrysler 300/300C Carbon Creations Challenger Style Hood 05-10 Chrysler 300, Carbon Creations Challenger Style Hood 05-10 Chrysler 300C, Carbon Creations 112476 Hood, Chrysler 300 Hood, Chrysler 300C Hood, Chrysler 300 Challenger Style Hood, Chrysler 300C Challenger Hood, [Carbon Creations 112476 Hood] - $839.95 : 3rd Strike Performance, Your Source for Late Model MOPAR Performance Parts and Accessories! Carbon Creations designs and manufactures innovative and creative aerodynamic styles in carbon fiber. This product line focuses entire on carbon fiber products designed specifically for your vehicle. Each product is manufactured with the highest quality standards and inspected by our quality control team before leaving our facility. These products utilize Grade “A” carbon fiber material and are finished with a high quality clear coat with UV protection. Our products are designed to be as light as possible while retaining durability and ensuring safety. Carbon Creations products are up to 70% lighter than OEM factory parts. Over the past few years, Carbon Creations products have been widely exposed by the media as being the most prestigious carbon aerodynamic brand in the industry. If you want a body kit with the latest high-tech style coupled with functional strength and light weight, there's no other choice but Carbon Creations by Extreme Dimensions. Every Carbon Creations body kit is designed and engineered for the specific vehicle, to be the most aerodynamic possible. Carbon Creations Carbon Fiber parts are up to 70% lighter than OEM parts, yet they're strong enough to be used under grueling racing conditions. They're designed to be as light as possible without sacrificing durability and your safety. Every Carbon Creations Carbon Fiber part is manufactured to the highest quality standards and undergoes a rigorous inspection process before it leaves the factory. Note: Sanded, primed or altered parts are non-returnable. Hood is shipped via Truck Freight. Hood is normally shipped to a business or terminal address. Delivery to residential address is available at additional cost. Upon receiving the Hood, please be sure to inspect the item for "freight damage". If there are signs of freight damage you must refuse the item, then contact us immediately.